We are delighted to present the second issue of Energy Aspects’ new Global arbs and trade flows service. Users can access global trade flows data through our data service. Contrary to our expectations of flat or slightly higher exports m/m, global waterborne crude oil exports fell by 0.55 mb/d m/m to 43.87 mb/d according to Kpler in September, albeit not as low as the 43.41 mb/d seen in July. The decrease was led by a sharp 0.53 mb/d drop in OPEC loadings to 26.17 mb/d, driven by accelerated losses from Iran. Light crude exports rose on sharply higher US exports to over 2 mb/d according to the EIA and a modest uptick in CPC exports, much of which headed to Asia, like US exports. Even though Urals loadings rose sharply amid higher Russian production and Mexican exports picked up modestly due to ongoing refinery problems, the steep drop in Iranian exports, to around 1.7 mb/d, weighed on sour exports. October global crude exports should remain close to September’s levels even as Iranian loadings drop precipitously (0.5-0.7 mb/d m/m) ahead of the 4 November deadline and even as loading programmes point to lower West African volumes due to a fall in Nigerian exports and slightly lower CPC exports. By contrast, US exports are set to be sharply higher, possibly by 0.3 mb/d as refinery maintenance kicks in and as the export arbs were open for October, while we expect Saudi Arabian exports to rise by 0.35 mb/d to 7.7 mb/d. Russian exports are also set to rise due to refinery maintenance and higher production, which has resulted in at least two Urals injection cargoes for this month. In turn, this has pushed Urals differentials lower (and are weighing on Brent spreads), opening the arb to ship the grade out of the region, including to China. Iranian exports may drop by 2 mb/d to below 1 mb/d in November and possibly December, too. As such, we expect overall global exports to decline, especially as Saudi Arabia’s spare capacity is effectively maxed out, with exports at best increasing by 0.2 mb/d m/m next month, underpinned by destocking. Finally, freight is keeping a lid on US and North Sea exports to Asia. Indeed, the recent freight rally has been the single biggest development for global trade, and while freight rates remain below 2016 levels, the rise (likely due to a combination of Iran needing to float its crude, thereby tying up their vessels and a buying binge by China) has sapped a lot of enthusiasm from the crude market. Based on our outlook for WTI-Brent, Brent-Dubai and WTI-Dubai, we expect the east to continue pulling barrels, at least until Saudi Arabia and Kuwait manage to restart the Neutral Zone, which is unlikely before January 2019. But freight is a significant headwind in the near term and has made US and North Sea arbs to Asia marginal at best. US export arbs to Europe are open, however. 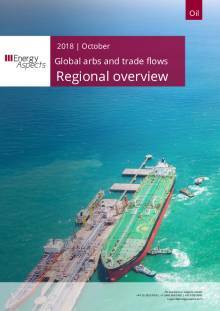 Asia cannot be starved of both Iranian crude and US exports, especially as three new refineries start up and Asian product markets remain strong, so Asian crude prices will have to rise more to compensate for higher freight rates. We also expect Middle Eastern flows to the west to decline, not just because GCC and Iraqi volumes are being pulled east to offset Iranian losses but also due to the start of new refineries. Rongsheng, Hengli and RAPID are designed to run baseload Middle Eastern barrels, particularly from Saudi Arabia, which means incremental Saudi production will have to swing east. Cutting exports to the US will not be palatable politically at this time, so we expect Saudi Arabia to reduce exports to Europe as it strives to meet the increased eastern demand. Iraqi exports to the US should fall, however, given the uncompetitive pricing and pull from Asia. Even Latin American crude is being pulled to the east, starving the USGC of sour barrels, supporting Mars values. The Global arbs and trade flows service is only available to companies that also subscribe to Energy Aspects’ Crude oil service. Users can access global trade flows data through our data service.June loading crude program..
Users can access global trade flows data through our data service.February total seaborne lo..
Users can access global trade flows data through our data service. Global waterborne an..
Users can access global trade flows data through our data service. Global waterborne a..
Users can access global trade flows data through our data service. In line with o..